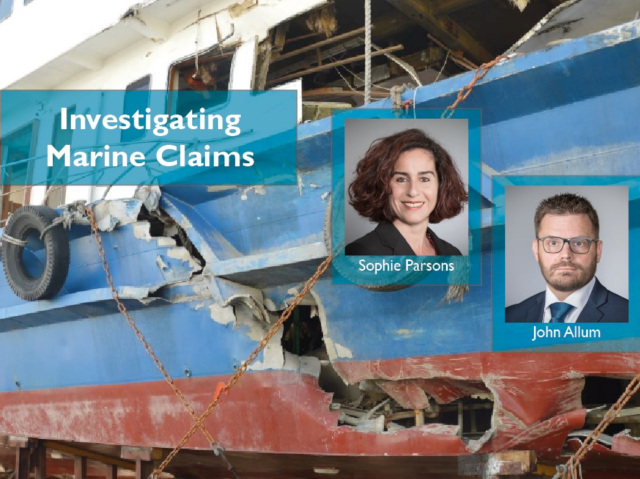 Recently Dr John Allum and Dr Sophie Parsons from Hawkins’ Hong Kong Office attended a Hong Kong Skuld P&I Casualty Seminar on the Investigation of Marine Claims. The presentation incorporated a discussion of materials failures by Dr Parsons, and a discussion of fire fighting strategies by Dr Allum. Dr Allum illuminated the differences between older and newer strategies behind fighting fires in marine incidents. Simply having firefighter training, or having access to either CO2 or water based extinguishers, may not always be adequate in a cargo fire situation. CO2 can take time to release, and both CO2 and water can cause a bad reaction with certain cargo. Problem cargoes can be anything from scrap metal to lithium-ion batteries. Techniques that firefighters and fire investigators are currently using more often in marine fires are water lances, spray systems and foams. Both passive systems, and active systems such as smoke bombs, have also been used. To use either strategy properly, sufficient training is a must. If you would like to schedule a presentation from a forensic engineer, please contact us.